come for her in the afternoon. Will and I went over to Woolfs awhile. I spent the evening reading. Will went over town awhile. weather more pleasant. Monday April 11th 1892 It was a very nice day. I washed some things in the forenoon and in the afternoon Mother and I took the plants out, gave the window a cleaning, and picked up things a little around the back porch. We got supper over and I read a little. 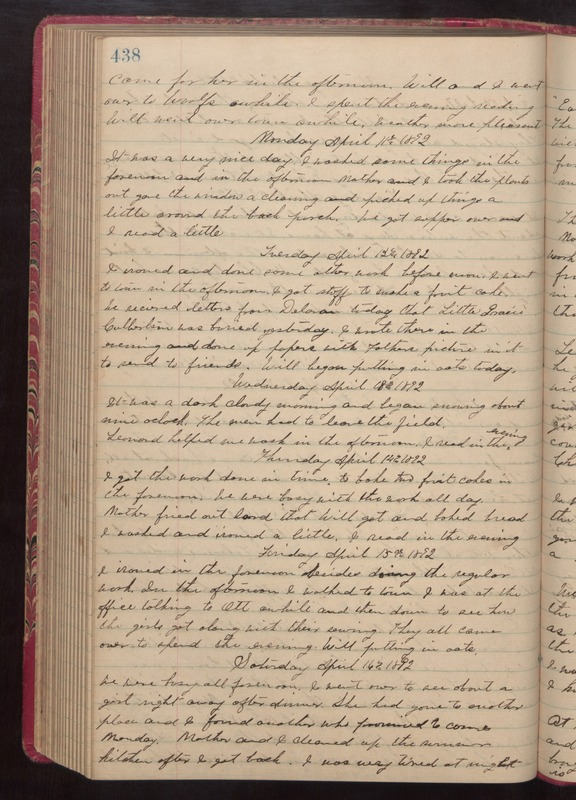 Tuesday April 12th 1892 I ironed and done some other work before noon. I went to town in the afternoon. I got stuff to make a fruit cake. We received letters from Delavan today that Little Gracie Culbertson was buried yesterday. I wrote there in the evening and done up papers with Fathers picture in it to send to friends. Will began putting in oats today. Wednesday April 18th 1892 It was a dark cloudy morning and began snowing about nine oclock. The men had to leave the field. Leonard helped me wash in the afternoon. I read in the evening. Thursday April 14th 1892 I got the work done in time to bake two fruit cake in the forenoon. We were busy with the work all day. Mother fried out lard that Will got and baked bread. I washed and ironed a little. I read in the evening. Friday April 15th 1892 I ironed in the forenoon besides doing the regular work. In the afternoon I walked to town. I was at the office talking to Ott awhile and then down to see how the girls got along with their sewing. They all came over to spend the evening. Will putting in oats. Satufrdsay April 16th 1892 We were busy all forenoon. I went over to see about a girl right away after dinner. She had gone to another place and I found another who promised to come Monday. Mother and I cleaned up the summer kitchen after I got back. I was very tired at night.